Researchers studying awe in a lab setting can’t take participants to awe-inducing locations like mountaintops, and the standard of watching videos of those situations has limitations. To help solve this problem, Hayley Goodrich ‘17, a Psychology concentrator at Hamilton College, and Educational Technologist Kyle Burnham recently set out to explore the use of Virtual Reality (VR) for Goodrich’s thesis project on the experience of awe. awe arises when something in the environment is vast and cannot readily be incorporated into one’s existing meaning frameworks. Goodrich wanted to explore if awe really did emerge in response to a violation of some meaning-making structure. Studying such a connection necessitated that she first make participants feel awe. In order to make people feel as realistic a spine-tingling, jaw-dropping awe sensation as possible without leaving the laboratory, she turned to the world of virtual reality. 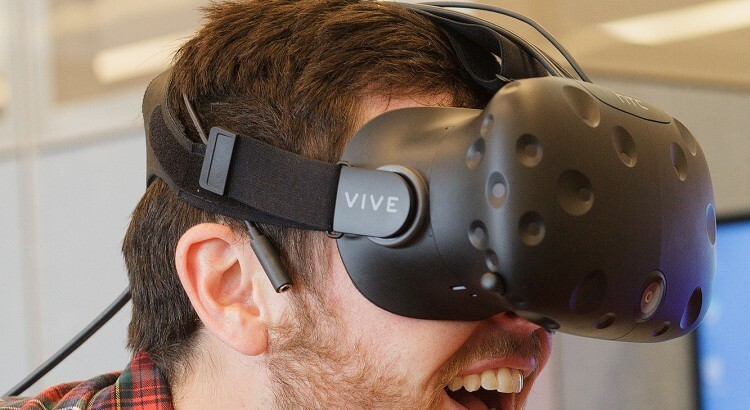 Goodrich and Burnham began their efforts by considering awe-inducing apps that Goodrich could use to conduct her research in combination with the HTC VIVE. In total, 42 of her participants wandered atop the summit of a virtual Mt. Everest while the remaining 40 explored a simulated IKEA kitchen. She asked individuals to provide self-report ratings on how much awe they felt and complete a pattern detection task to measure their efforts at maintaining a sense of meaning. Overall, those in the Everest condition demonstrated greater efforts at maintaining meaning than those in the IKEA condition. Higher awe was associated with more meaning-maintenance, suggesting that awe coincides with some sort of meaning violation. And within the IKEA condition, higher levels of awe were associated with greater efforts at maintaining meaning, but those who reported higher levels of awe in the Everest condition actually demonstrated lower efforts at maintaining a sense of meaning. Goodrich suggests that these mixed results show some promising initial evidence for a relationship between awe and meaning. Perhaps most importantly, this project established a place for VR technologies in the psychology lab at Hamilton. While VR is fairly new to the psychology research scene, Goodrich believes that it will soon become an externally valid research tool, especially useful for paradigms involving emotion induction or imitation of real-life experiences that cannot be duplicated easily in a lab setting.